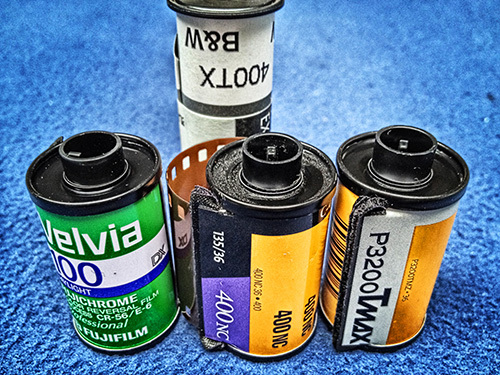 We develop Process E6 (Slides, Fujichrome, Ektachrome, etc. ), Process C41 (Portra, Superia, etc.) and B&W, Black and White film (Ilford, TMax, Tri-X Pan etc.) and Disposable Cameras. "Process Only" will be available for pick after 8AM the next business day. With prints and/or scans 2 full business days. All processing is done on premises by technicians with 35+ years of experience. Our processing equipment is maintained in top condition. We run Fuji Control Strips on a regular basis and make any adjustments as necessary. Your film will be sleeved and returned with your order. We don't scan your film and discard your negatives. Adjusted Processing (Push / Pull) and Cross-Processing $2.00 extra charge per roll. Advanced Photo System Processing (Advantix). We can also process, print and scan APS Film. Kodachrome K12 & K14 - We can process as Black & White negatives. Film processing price does not include prints or scans. Plus $2.75 for a CD, $4.25 for a USB drive or FREE Upload to Dropbox. Includes Index prints of each roll. High Rez $3.72Plus $2.75 for a CD, $3.25 for a USB drive or $2.75 to Upload to Dropbox. Includes Index prints of each roll. We don't sell film, Pictureline is the best place to buy it. They are located a couple of blocks from us.